Speaking of Telegram or WhatsApp Messenger, the comparison can be quite interesting! First of all, it is necessary to identify the main criteria according to which their comparative characteristics will be compiled. Among them, we decided to highlight those issues that may be of interest to users. What is WhatsApp? WhatsApp Messenger is an application for popular systems that can work as an online service. Required for messaging, creating group chats and making calls. WhatsApp could seriously affect the market for instant messaging services, even slowing down the growth in the use of SMS messages. Telegram is free of charge instant messaging web application allowing you to exchange messages and files having Internet on the device. There is an online version, a client on a computer and applications for smartphones, both on Android and on the iPhone. Despite the fact that the WhatsApp menu has a more structured look, the Telegram’s looks more lively and diverse. But, nevertheless, everyone chooses for himself what is best for perception. The tangible difference of Telegram is that if someone tries to log in to a user account from another mobile device or computer during a session that has begun, he will immediately receive a notification about this. WhatsApp has no such function, and this is one of the reasons why the Telegram is the instant messenger where the possibility of control is better thought out. Despite the fact that at first glance the organization of the chat is identical, the main differences lie inside. Telegram has all correspondence stored on a special “cloud” (server) of the company, which is undoubtedly better than storing all the information on a smartphone and taking a large part of its memory, as it is realized in WhatsApp. Because of this Telegram feature the telephone and the application itself work faster than WhatsApp. At the same time, the latest mentioned application provides the ability to enable data saving during a call. Also, after removing Telegram application from the phone, the correspondence is not killed along with it which can be not so good for your privacy. But if you delete WhatsApp, then you will not find the previous messages, unless you have taken care of creating a backup copy. 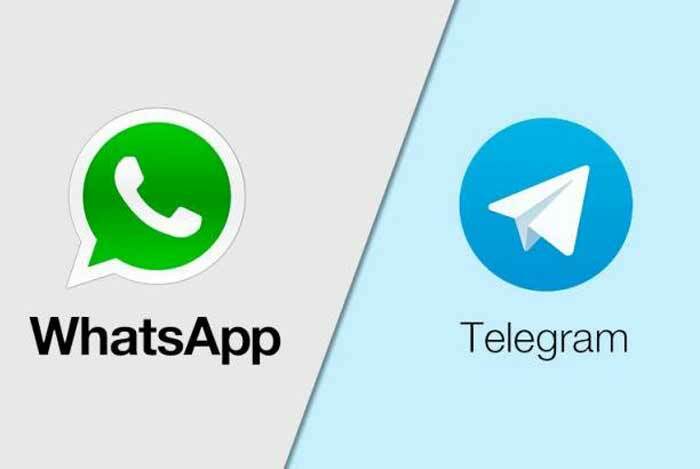 Making a comparative description of the Telegram vs WhatsApp, it is important to note that both applications are able to offer their users the ability to transfer multimedia files. But Telegram is better than WhatsApp in this case due to the fact that large amounts of information are transmitted through it faster because of the features described above. Discussing messaging, it is important to note that the developers paid great attention to the security of the Telegram application, which made it the best in this sector. Telegram began to use end-to-end encryption from the very beginning, which made this service the best for secure communication. Not so long ago, WhatsApp joined it, and now they both work according to the same scheme. Still, WhatsApp developers have paid much more attention to different ways of protecting data, so, according to numerous WhatsApp review, in this matter, it became better than Telegram. To ensure security in Telegram, you can put the lock code on the chat page (and it is better not to forget it, otherwise you will have to reinstall the application, which will lead to the loss of secret chats), configure two-step authorization, adjust account self-destruction, delete active sessions. Also, you can create secret chats in Telegram. Why are secret chats better than usual? Messages sent in this mode do not remain on the server, as they are removed from there immediately after delivery. But WhatsApp has its own feature, which increases the security and convenience of its use: to activate an account on a computer (whether it is a PC version or a web version), you do not have to enter your data, you just need to catch the QR code with a smartphone screen. Speaking of Telegram and WhatsApp it is worth saying that the process of creating a group chat for both applications is almost identical. The difference lies in managing the group. In WhatsApp chat, new members can be added to the dialogue only by the person who is the chat administrator, while in Telegram this option is available to any member of the group (provided that the person who created the group did not appoint administrators). This is better for those groups in which freedom of communication is important. Simultaneously, WhatsApp allows better control of group activity such way avoiding appearing undesirable members. Telegram allows you to track the status of “online” in the chat, which is not available in WhatsApp. But having fewer complicated settings opportunities WhatsApp is easier to use for group chats.